As we've already covered in the past, the DC Extended UniverseStarted as DC Comics' answer to the MCU, the early films in the franchise stumbled out of the gates, often mired in grim-dark storytelling and the rushed need to get this franchise started. Eventually, though, the films began to even out, becoming better as they went along. Still, this franchise has a long way to go before it's true completion for Marvel's universe. is kind of a train wreck. While there are gems in the lot (Wonder Woman is largely enjoyable while Aquaman is great in a The Fast and the FuriousStarted as a film about undercover policing in the illegal street-racing community, this series has grown to encompass a number of different genres and become one of the most bankable franchises in the world. kind of way) by and large the film series hit the ground in a kind of prone, face-plant position and has struggled to recover. Most of that blame rests as Zack Snyder's feet -- whatever your opinion may be of his films, or of the director in general, it's pretty clear he had no idea how Superman and BatmanOne of the longest running, consistently in-print superheroes ever (matched only by Superman and Wonder Woman), Batman has been a force in entertainment for nearly as long as there's been an entertainment industry. It only makes sense, then that he is also the most regularly adapted, and consistently successful, superhero to grace the Silver Screen. should have been depicted on screen. This lead DC ComicsOne of the two biggest comic publishing companies in the world (and, depending on what big events are going on, the number one company), DC Comics is the home of Superman, Batman, Wonder Woman, and just about every big superhero introduced in the 1930s and 1940s. 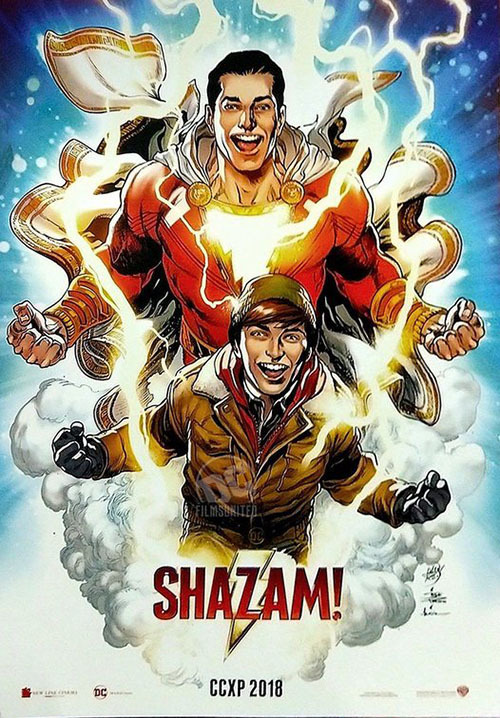 to effectively retire both heroes from the DCEU for a time, opening the door for the off-brand Shazam! The movie essentially preserves the character's origins when bringing him to the big screen (for the first time since the serials of the 1940s). In the New Line Cinema film, Billy Batson (Asher Angel) is a 14-year-old kid abandoned by his mother years earlier. He's spent the intervening time looking for her, running from every foster family he's been placed with in the hopes that once he found his "real" family he could just live with her again. After his most recent attempt to find his mother (which fails), Billy is placed with a very nice family (with a lot of other foster kids). One of them, Freddy Freeman (Jack Dylan Grazer) -- a geeky, superhero-loving 14-year-old -- befriend Billy and becomes his near-constant companion. When Freddy is attacked by some bullies from school, Billy steps in, fights them off, and then runs, taking the trouble with him. After diving into a subway, free of the bullies, Billy is pulled into an alternate dimension, the realm of sorcerers. 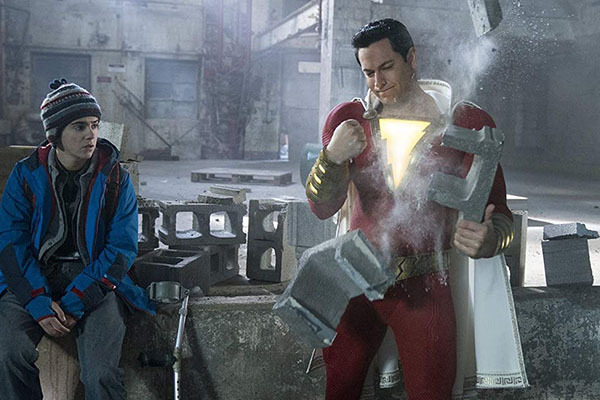 There, the magician Shazam (Djimon Hounsou) grants Billy his power (before fading away to dust), making Billy into the champion Shazam! The powers make him effectively invincible, with flight, super-speed, and lightning-based attacks. They also grow him to adult age and size, and nice benefit he uses to buy some beer once he thinks of it. After goofing off for a little while, enjoying being a teen with all these powers, Billy eventually realizes he has to buckle down and be a real hero because there's a villain on the loose: Dr. Thaddeus Sivana (Mark Strong). Thaddeus, at one point, was supposed to be Shazam's champion, but his heart was weak and he was rejected. He wants the powers of Shazam and, with the help of Shazam's mortal enemies, the Seven Deadly Sins, Sivana might just be able to get them and use them for his evil plans. From the start, Shazam! follows an odd path with it's hero/villain dynamic. The first five minutes of the film are devoted not to Billy (who gets his own introduction, replete with flashbacks, later) but to the villain. Thad is shown as a young boy, berated and belittled by his father and brother. As they're abusing him, on and on, Thad is mysteriously sucked in the sorcerer dimension and given a chance to be a hero. Once he's rejected, he devotes his life to finding a way back to claim the power. It's a good setup for the villain, a way to shorthand a lot back-story about the Shazam powers as well as informing us of the evil of the Seven Deadly Sins. It's also a villain origin the movie largely squanders afterwards. Once Thad grows up (into a game but misused Mark Strong), his character barely does anything. 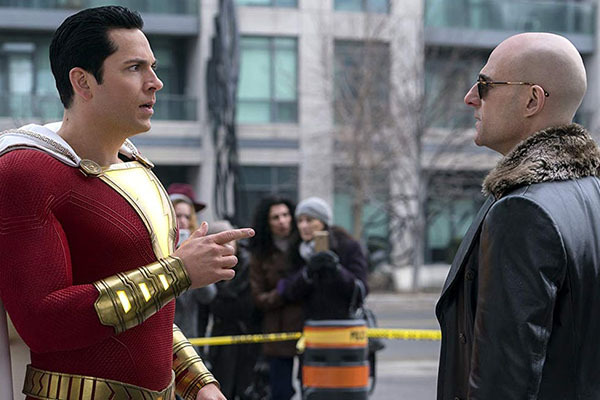 He gets back to Shazam's realm, steals the power of the Seven Deadly Sins (which, essentially, makes him as powerful as Shazam), and then just waits for a hero to show up. Sure, he has a basic to-do list, namely going to his father's company and having his petty revenge after 35 years, but there's nothing else to the character. There's no shading of his background over the last 35 years (why does he still hate his family since, for all we can tell, they still gave him a posh life and funded his ventures) and after getting his revenges on his one plot detail, the rest of his time is spent floating around, waiting for a hero. He's about as low stakes, and low impact, as a villain can get. That means that all the action, character development, and interest has to rest with Billy/Shazam and his friend Freddy. At least in this regard the film delivers. Asher Angel is great as the 14-year-old Billy, charismatic and funny with just the right about of broken emotion for a kid that's essentially grown up on his own since being abandoned. This is mirrored by Freddy who has his own quirks, his neediness and desire to be liked, and they both come across as realistic foster kids. 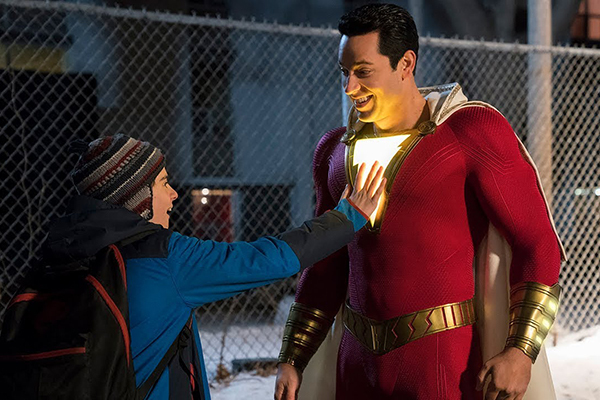 Certainly the show is stolen, though, by Zachary Levi as the "grown up" version of Shazam. His has the right child-like charm, the ability to be dumbfounded by the things "adults" do, selling it with just the right amount of humor and charm. As many critics have noted, this film is essentially Big but with superheroes. 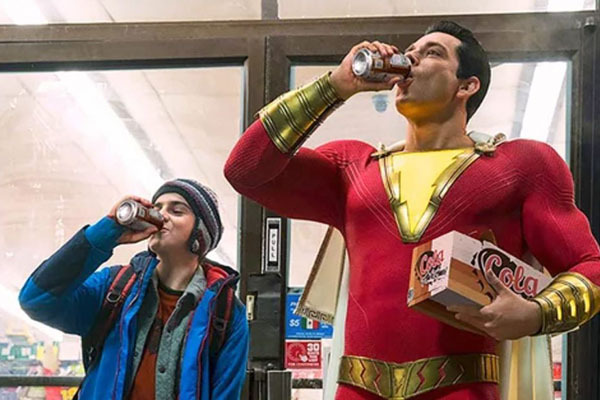 It's an apt comparison to a certain extent -- Billy certainly riffs on it when he notes that he doesn't have to be a kid anymore because Shazam makes him into an adult -- but at the same time the film finds its own lessons to learn from the exercise. Billy isn't like Tom Hank's character in Big because, if at any moment superhero life becomes to stressful he can escape. 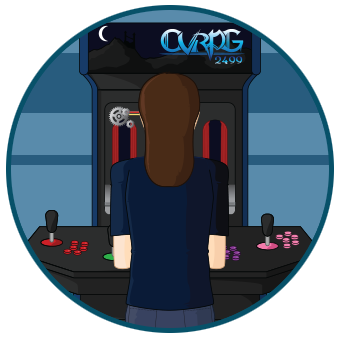 His powers can be turned on-and-off at will, reverting him back to being a kid, so he doesn't have to try and be an adult as there's always an out. Instead the big lesson here is all about family: finding a family, accepting them, and letting them into your life. Billy is closed off at the start of the movie but the powers help him to grow and evolve. He doesn't just learn to be a hero but also to be a better version of himself (at all age levels), which is then reflected by accepting his new foster family and letting them in on his double-life. It's a solid lesson considering this film plays like a family movie grafted onto the DCEU, and it's certainly a more worthwhile storyline than "am I a god?" or "Superman and Batman bond over their love of all things Martha." it might be a little too family friendly for DC fans, but I think within the context it plays just right. Shazam! isn't exactly a high-stakes movie, partially because the villain doesn't really seem to even know what he wants besides "more power" and partially because Billy just isn't ready for anything world-ending. Not that he should be expected to handle events like that -- he's 14 years old and there are other heroes in the 'verse (Wondie, Supes, and Bats among them) to handle the really big issues. Maybe if Shazam is ever introduced to the rest of them officially (like in a Justice League 2, if that ever occurs) then he can upgrade to bigger threats. Instead it would just be good for the movies to give him a villain he can really connect with, one who is more emotionally vested that can act as a good counterpoint for the boyish charm of the lead hero. Over all, though, Shazam! is probably the most enjoyable film in the DCEU. It's fun and funny, moving along at a good clip, without any of the darkness inherent to the DCEU movies. If this is the direction DC is heading with their future cinematic efforts, I'm willing to admit they just might have turned a corner into something really good. April 9, 2019: Say My Name!